The JDSU Four Port OC-3/STM-1 LIM Multiplexer (J6828A) is designed to be used with the JDSU STM-4/OC-12/STM-1/OC-3 LIM (J6810B) to allow the simultaneous monitoring of both directions of four STM-1/OC-3 circuits. 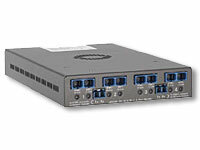 This stand-alone multiplexer has four pairs of STM-1/OC-3 optical input ports. It is designed to be used with the JDSU STM-4/OC-12/STM-1/OC-3 LIM (J6810B) operating in a special mode to expand the latter’s analysis capability to both directions of four STM-1/OC-3 ATM cell streams simultaneously. This external LIM is powered from a 5V DC supply with AC input (provided). Note: This device can only be used with the JDSU STM-4/OC-12/STM-1/OC-3 LIM (J6810B) (is not supported on J6810A, or stand-alone) and is for analysis only – it does not have STM-1/OC-3 optical outputs. Currently this device only provides useful functionality with the Signaling Analyzer Real Time (SART) – Wireless Protocol Test (J7830A) products.